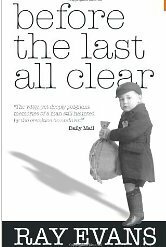 A month or so back I was contacted and asked if I would like to read and share my thoughts on Before the Last All Clear : Memories of a Man Still Haunted by the Cruelties He Endured. On the tails of The Chronicles of Narnia Reading Challenge, I said yes! Being fascinated by the idea of the Pevensies staying with Professor Kirke during World War II, I thought it would be interesting to read about an actual-real-life-experience that one boy endured as an evacuee. Ray Evans was born and lived in Liverpool when England entered the war. Liverpool was one of the most bombed cities outside of London because of it's location and importance in being a major port. In 1939 Liverpool evacuated its children (and some of the mothers) as a preemptive measure to save their citizens (and future society) from attack by the German Luftwaffe. Evans, his brothers, sisters and mother were evacuated to Llanelli, Wales where he lived for the duration of the war. At the time of his evacuation, Evans was only six years old. Imagine being six years old and during a time of angst and war, being sent to live with complete strangers. Without a world war going on in your midst this would be a scary thing. Spending evenings huddled in backyard garden bunkers and living off rations with people who have hitherto been strangers to you would be confusing and terrifying in the extreme! As you might imagine, this book is hard to read as you let your brain piece together a picture of what Evans' life looked like in his formative years. Evacuees at the time were sent to live in the homes of other people. These homes were referred to as "billets" and each child reported to a billeting officer who was supposed to make sure that the children were safe and cared for by the families and people that they were placed with. Some of the children had wonderful experiences with their billets. Others, like Ray, underwent extreme hardships, being placed in homes with people who found the children more of a bother than anything else. I'd liken Evans' experiences to being a foster child in a system gone bad, never quite receiving the love and security that young children crave. In the best of economic times this would be hard. But when food is rationed and winters are terribly cold, it becomes harder still. This is a heart-wrenching tale. There is a lot of foul language scattered throughout this book. Some of it, I would say (given the timeline), is justified. Most of it is wrapped up in quotes from people with potty mouths. Ray Evans definitely has an intriguing story to read about, but he is not the most polished author you'll come across. He changes tenses a lot which can be confusing at times. At times he will begin a paragraph in the past tense and end it in the present which causes the reader to become easily lost at times. However, I will say that the concluding paragraph in Before the Last All Clear is one of the best summarizations and conclusions that I can remember reading in a very long time. The subtitle - Memories of a Man Still Haunted by the Cruelties He Endured - made me think dark thoughts and I almost loathed the idea of picking up the book in the first place for fear of what I would find inside. I would say not to stress too much that you'll be exposed to sexual abuses or extreme physical crimes against the children. That doesn't show up, although the title suggested to me that it might. Rather, the cruelties are more about environment, expectations, food deprivation, etc. Not to say that these were not cruelties, for they most certainly were. They just weren't "the worst" of what was coming to mind upon reading the title so I want to offer that little disclaimer here. On the whole, I heartily recommend this book to anyone. It is intriguing both personally, as to Ray Evans' story and generally, as historical fact. I'm glad to have had the opportunity to read it and become more familiar with life as an evacuee from England during World War II. That was a terrifying time, to be sure, as well as a heroic one. Even as it relates to six year old boys. Thanks to Mr. Evans himself who sent me a copy of his book to read and reflect on. That does sound like an incredibly hard time. I don't know that I could send my kids without going with them. It was probably better for families like the Pevensies who had siblings to provide company and familiarity. This sounds very good, but very hard to read. It sounds like the flip side of a novel I read, Good Night Mr Tom, about a little boy from a terrible home situation whose evacuation turned out to be the best thing that ever happened to him. Sounds like a very interesting story. I've linked to your review on War Through the Generations.